My Aviary has been built for approx 8 Months. 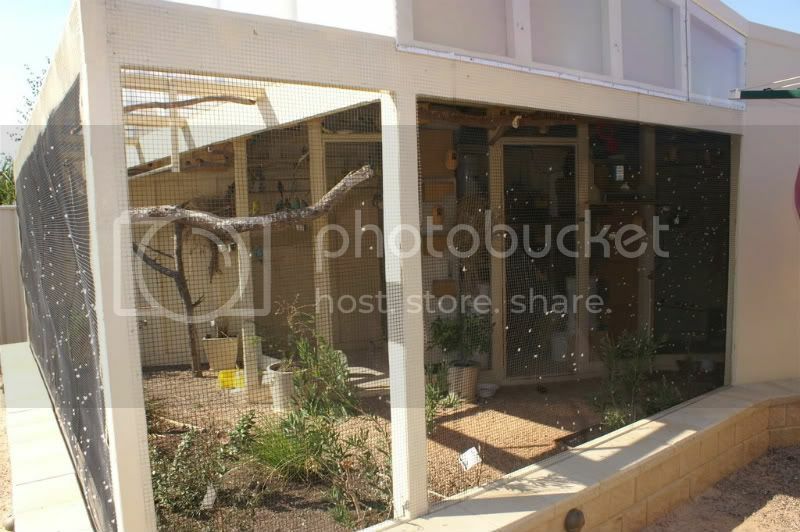 My Aviary is seperted into 4 Aviaries, One big Aviary and 3 smaller Aviaries (One of these Aviaries I use as a Bird Room. I have had great breeding results in the first 8 Months breeding around 50 young. In the last month I have noticed a lot more mice in my aviary than usual. I knew when I built my aviary I would have mice as whenever I have had birds in the past I have had mice. I bait and have traps in the bird room and have caught a few. The big aviary has not got a concrete floor and it also has garden beds in it. I have found that the mice are digging holes and making themselves right at home. What I'm asking is what ways can I start getting rid of these rodents. I know I have to plug up 2 holes that I have found that they are coming in from but are there other ways I can try and get rid of them in the aviary. Any suggestions would be welcome. Are mice common in all aviaries as its getting me a bit down at the moment? Mice will tunnel in through soil floor aviaries as you are finding and they can actually squeeze through the average aviary mesh as well. Its super important that they cannot get to the main sources of food and water...so pedestal setups to serve seed and water will help ( poles so mice cannot run up )...and they can get to any food sources hanging off the aviary wire or off wood. There are bait boxes with small drilled holes in each end and bait in the middle. The holes stop birds getting into them BUT the mice drag bits of poison back out as they leave the bait box, so thats worry. My husband sets the bait boxes up in his aviary with something around them so the birds cannot access and any poison spilt by the mice retreating is in an area also the birds cannot access. The safest way is to deal with them outside the aviary so they dont get in. Most aviaries have mesh that goes to ground level where if the tin was at least 2-3 foot up the sides it would stop entry through the mesh. Our Cavaliers are both rat and mouse killers so we dont have too many rodents that they dont find, kill and eat. But we have to be careful with using poisons because of that. My aviary is made of wood, and lots of wire. The Mice climb up the wire very easily, but i cannot change this. SO are you saying mice can climb up wood as well as wire? I think no matter what i try mice are still going to get in. I dont want to concrete the whole floor of the aviary as this will ruin the look and living arrangements of my finches. I'm really interested in these pedestal feeders you were talking about? At the moment i use steel feeders with a spillage tray underneath. These are attached to a wall of the aviary or are on the floor. I also have quails and leave feed for them on the bottom of the Aviary how can i get around this? I love quails and dont want to get rid of them. Open to any ideas. What about the garden beds i want to keep these for my finches, if i was to put water down the holes they dig, do you think that would help as i know mice hate water. Concrete would be the best solution and potted plants and shrubs for the finches...but I understand the reluctance to change. We started out with planted aviaires and now have had to change it all. There are still soil floor in my husbands aviary and he has the same issues in there that you have...more so through winter. I made feeders from old discarded pedestal fan bases. Two discarded pedestal fans...use the foot section and the upright pole. Upend one into the other and put a large plastic plant pot saucer on top for the food. Mice cannot climb these, but they can get to anything on the aviary wire. Birds can die in 24 hrs from mice contaiminated food supply. There are quails in my husbands aviary too. He tries to keep their food limited to very little in trays on the ground and the rest is what drops from the seed trays on pedestals. Wood will not work...perspex will work as will tin. At least 2 feet or higher as mice can jump a fair way up. Flooding their tunnels is a good idea, but I have seen a mouse swim under water for hours...they have ways of breathing water and surviving....determined little suckers !! If you flood the tunnels you need a way to destroy any that come up as you do it...my dogs work well for these moments. 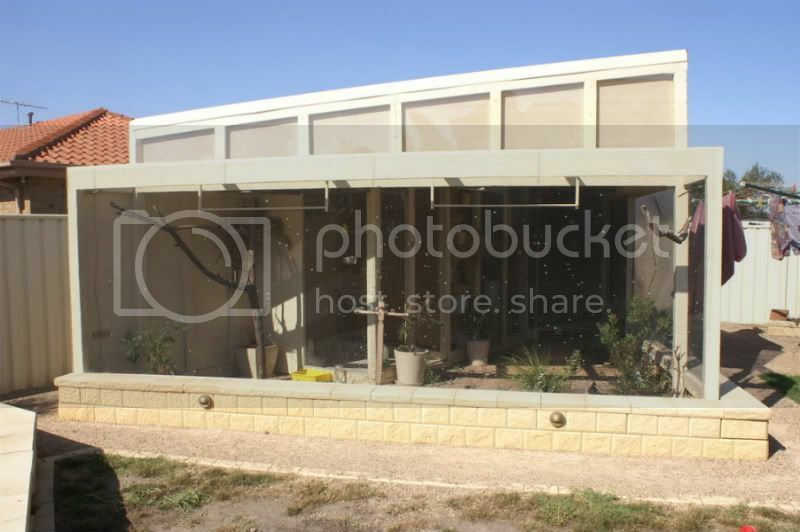 The best bet would be to get steel sheeting and put a guard around the base of the aviary up to 50cm. I have seen both mice and rats climb wood and even verticle bricks so I doubt the wood would stop them. I am currently using a pedestal bird stand (like the ones you get for tame parrots to sit on) to feed fresh food and I also have my other feeders suspended from the roof of the aviary for flying birds. The other method for home made pedestals that kaz uses is to get the legs and pole from an old pedestal fan and get another set of 'legs' and upend this on to the top of the pole and place a large dish on top. Thanks everyone for your ideas, I think iwill just have to try my best and do what i can. i have a soil floor aviary because i prefer my avairy to look natural so i have put plastic garden edging around the outside of the aviary and dug a few inches into the ground and left some above ground so the mice have to dig down a long way to get under it.The wire on my aviary has holes too small for mice to get through. How small is your aviary wire ? Mice can get through a hole that is less than half an inch so they CAN get through 10mm by 10 mm aviary wire. Tunnels under the aviary in soil have been detected at deeper than 2 feet as well. Or use a finner wire mesh, or double over the wire mesh you have already to reduce the hole size?? all i can think of otherwise is POISON - used with a very desirable bate and place far away from your aviary. As you can see from the photo's below, my aviary goes a fair way up, so doubling the wire is almost impossible as there is too much of it and it would not make the aviary as see through as it already is. thanks for the suggestion anyway. I have flood lights that shine on to the aviary and when i turn these on at night time i can see the mice running around up and down the wire in the inside as they can see the light.I take it the mice would be able to get on to the brick paving I have around the perimeter of the aviary. I suppose I have to put something on top of the Brick Paving so they can not climb up on to the bricks and through the wire and get in. What about Plastic, how thick would the plastic have to be?My Aviary wire is 12.5 x 12.5mm so based on feedback I have received mice can get through that no problem.I think I need to do a thorough check and make sure mice can not get into the Aviary, then I will make some refinements to see if i can keep them out. What about Walls, some of my internal walls are Cement Sheet, would this be the best place to attach food if i needed but to support the food it would have to be attached to some sort of wood, would mice get to the food if I did this.I just feel a bit down at the moment as there are a few mice in there and want to get on top of it before it gets really bad as i know they can breed very quickly. If you are worried about the look of your aviary, I like Kaz's idea of the clear perspex :hap: Or use a finner wire mesh, or double over the wire mesh you have already to reduce the hole size? ?all i can think of otherwise is POISON - used with a very desirable bate and place far away from your aviary. I apologise if those photos are too big, can someone let me know, I might of used the wrong link. Wow, I love your aviary! Would you mind if I keep a photo of it to show my partner when we build the aviary at our new house next year? As far as placing feed dishes on walls I would place a plastic or metal (you could use clear perspex) backing in between the feeder and the wall so that the mice have nothing to grip onto. You would want the perpex to be probably a 7-8 inches wider on each side than the feeder. It won't stop the mice jumping onto the top of the feeder but they'll be stuck hen so it should deter them a fair bit. I've tried that stuff Kaz, they will chew through it. :hap: WOW!! OMG!!! Totally Jealous!!! :hap: That is an awesome aviary! Did you build that yourself? Hi thanks for all the great feedback for my AVIAR. It was a lot of hard work, but i did have alot of help from a close friend. It did cost me quite a bit of money. But it blends in so well in the back yard. I'm very happy with it. I am working on alterations at the moment but want to try and fix this Mouse Problem first. I'm so whats the word "upset that I have mice" They really annoy me and the way i've built the aviary its going to be hard to stop them, but i suppose if I can cut off the food supply I might get some where. So if plastic won't work I'm not sure what else to use. Clear perspex is very expensive, what about thick plastic? Will keep thinking about it. What about trying one of those plug in mouse deterent things. I've heard contradicting reports about thei effectiveness but it might be worth a try..
Melbournebudgies you have been a great help, thats what I love about this site everyone helps each other. Never heard of those mouse deterrent things, I have Power in My aviary? Might be worth a try, do you have any more info on them you can give me? Hey where in Melbourne are you located? You looking for any birds, got some nice young at the moment. Not sure where to buy them, you used to be able to get them on those home shopping sort of sites, try searching for electronic mouse/insect deterent on google. I've never looked but you may even be able to get them from Bunnings, etc. I am near Greensborough. I am looking for birds but I am being given some on the weekend and as I don't yet know how many, etc. I need to hold off for the moment until I know how full my aviarys will be. Some will be moved on once I know which I am keeping but I'll just have to see. I suggested thick plastic in a post further up...you buy it from spotlight or clark rubber...by the metre. I meant for outside the aviary too, the mice chew through it to get in. Will maybe try a combination of everything that has been suggested.. I might try the thick plastic but try and some how double up the ends or something like that, perspex is too expensive. Will keep plugging away, I am so Disheartened at the moment, I just want to beat them.